The website of Cave12, a nomadic concert venue presenting adventurous music in Geneva since 2001, is one of my oldest webdesign efforts, and has been undergoing minimal changes since the first, bare-bones html version back in the early 2000s. In addition to migrating the site into a CMS in 2009, I gradually applied some under-the-hood optimizations. One of those is the use of microformats, an open standard that allows webdesigners to tag specific pieces of semantic content – dates, locations, contact details, reviews, cooking recipes… – in a standardized manner, so that they can be understood by other (web-)applications. 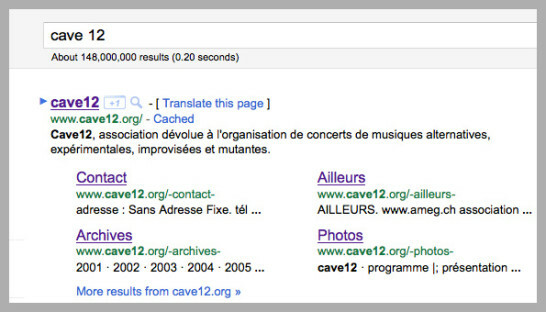 I applied the microformat for events (hCalendar) to all the concerts listed on the website, and last week I noticed that Google has been picking up that information, and is now displaying it in the search results (provided that you search for strings such as “cave12 concerts” or “cave12 programme“).